“Extreme remedies are very appropriate for extreme diseases”—Hippocrates. This philosophy has been epitomized by the “bench to bedside” success story of enzyme replacement therapy (ERT) for lysosomal storage disorders (LSDs). LSDs are a group of rare inborn errors of metabolism which are progressive, devastating multisystem disorders impairing growth, vision, ambulation, cardiac, or pulmonary function, causing debilitating bone and joint disease and invariably attenuating life span. Each disorder is a result of a deficiency of any one of the 50 lysosomal enzymes, activator proteins, or membrane transport proteins. Incidence of LSDs in India is not known; however, it is 1 in 5000–8000 live births in the United States, Europe, and Australia. Globally, the most common LSDs with an incidence of 1 in 60,000–120,000 are Gaucher disease, Fabry disease, and mucopolysaccharidosis (MPS) type I. Before 1990, treatment was palliative, although bone marrow transplant was performed for several LSDs since 1980s with variable results. Hope for treatment of LSDs became a reality with development of ERT. In the early 1970s, Brady et al., at the National Institute of Health, USA, were the first to successfully demonstrate clinical proof of efficacy of ERT by administration of purified human placental glucocerebrosidase intravenously in a 15-year-old and a 51-year-old patient with Gaucher disease. This placenta-derived product was the first ERT to be marketed in 1991 as alglucerase. Currently, ERT is manufactured using the DNA recombinant technology and is available commercially for 10 LSDs [Table 1]., This rapid stride is because of (i) the Orphan Drugs Act of 1983 in the United States, which provided pharmaceutical companies economic incentives to develop therapeutic products for rare diseases and (ii) development of disease-specific knock-out mouse or animal models such as Japanese quail for Pompe disease and cat and dog for MPS type I. The first publication of ERT was from BARC Hospital, Mumbai, which described a 5-year-old boy who started receiving human placenta-derived alglucerase (Ceredase®) since 1999. Limited production of alglucerase because of limited availability of human placentae spurred the development of a DNA recombinant product analog of human β-glucocerebrosidase, imiglucerase. Subsequently in the year 2002, patients who were initially being treated with alglucerase were transitioned to imiglucerase therapy. Procuring ERT in the early days was a lengthy process involving obtaining approval from manufacturer through charitable initiative, gathering documents including a prescription (countersigned by a doctor in government health service), certificate from the treating physician and a “P” license from the Directorate General of Health Services (DGHS), for import of drugs for personal use. Since the year 2015, patients can fill Form 12A online (SUGAM web portal, https://cdscoonline.gov.in/CDSCO/Drugs_Personal) to get the import license (Form 12-B) and obtain the custom duty exemption certificate from DGHS. ERT for diseases other than Gaucher disease was introduced in India in the ensuing years [Table 1]. Of these products, imiglucerase, agalsidase β, laronidase, and alglucosidase α already have marketing authorization from DGHS, whereas application for registering velaglucerase α, agalsidase β, and idursulfase are in the process. Major centers having expertise in administering ERT are situated in Bengaluru (Indira Gandhi Institute of Child Health & Center for Human Genetics), Chennai (Fetal Care Research Foundation), Hyderabad (Rainbow Children's Hospital), Kochi (Amrita Institute of Medical Sciences), Lucknow (Sanjay Gandhi Postgraduate Institute of Medical Sciences), Mumbai (KEM Hospital and Jaslok Hospital), and New Delhi (AIIMS and Sir Ganga Ram Hospital). Indian patients access ERT through charitable initiatives of manufacturers and clinical trials. Few affected children of central and state government organization employees, namely, those working in armed forces, paramilitary forces, police, and government-owned public sector undertakings are now getting ERT as their expenses are being borne by these organizations. Three manufacturers are providing ERT through compassionate access programs in India: Sanofi-Genzyme through India Charitable Access Program (INCAP), Shire HGT's charitable access program in India in partnership with Direct Relief [a non-governmental organization (NGO)], and Protalix Therapeutics. In the year 2007, Sanofi-Genzyme constituted the Indian Medical Advisory Board (IMAB) whose board members are international physicians of repute, 10 local physicians from centers across India, and representatives of Sanofi-Genzyme to review applications for ERT made to INCAP, decide and prioritize eligibility for ERT, oversee ERT administration, and make recommendations for diagnostic evaluations and clinical monitoring of patients. Eligibility for ERT is decided by objective disease-specific inclusion and exclusion criteria based on published international guidelines and recommendations. Members of IMAB have recently published guidelines for ERT for Gaucher disease in India. In the year 2011, Nagral et al. published preliminary experience of treating 25 patients of Gaucher disease with imiglucearse from five Indian centers. In eight patients treated for a mean period of 2.5 years, the hemoglobin increased by 2.2 g/dL, 50% had normal platelet count, and liver and spleen size decreased to one-third of the baseline size. In 2017, 240 patients with LSDs received ERT through the initiative of various charitable organizations, namely, (i) the INCAP; 121 patients with LSDs—65 Gaucher disease, 20 MPS I, 13 Fabry disease, and 23 Pompe disease; (ii) Shire HGT's charitable access program; 69 patients with LSDs—35 Gaucher disease (including 7 who got velaglucerase α as post-trial access), 27 MPS II, and 7 Fabry disease; and (iii) Protalix; 5 patients with Gaucher disease received taliglucerase α. In addition, 43 children of central and state government organization employees received ERT. From 2007 to 2012, a phase III clinical trial of velaglucerase α was conducted for patients with Gaucher disease at KEM Hospital, Pune, and AIIMS, New Delhi, allowing them free access to ERT. In 2001, alglucerase was started on a 7-year-old splenectomized girl with severe hematological, visceral, and skeletal manifestations of Gaucher disease requiring several packed cell and platelet transfusions. Subsequently, there was complete amelioration of all manifestations and she continues to be compliant and healthy on 11 years of therapy. 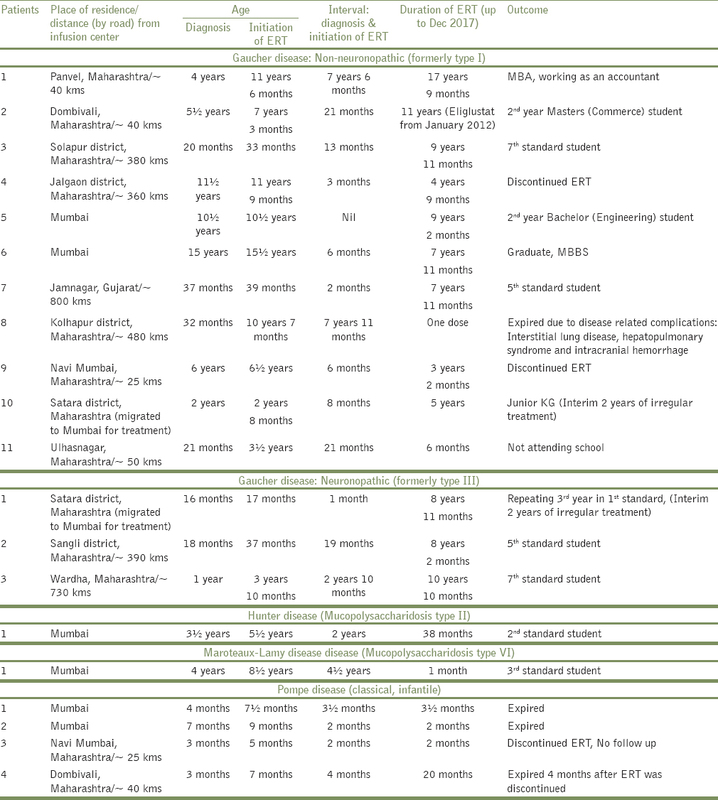 Over the years, ERT has been initiated in 19 patients with LSDs, of which 12 continue to receive ERT [Table 2]. In our experience, hematological response has been timely and none of the patients subsequently required blood transfusion or splenectomy. However, these patients did not attain optimal therapeutic goals for reduction in hepatosplenomegaly, normalization of bone mineral density, and growth in the recommended time frame. Despite ERT, skeletal deformities (kyphoscoliosis and pectus carinatum) progressed in type III Gaucher disease. Nevertheless, ERT has transformed lives for several of these patients with Gaucher disease who are now able to pursue their academic ambitions, seek employment as professionals, and even get married [Table 2]. However, in a few patients we are encountering rare or unusual complications such as development of gaucheromas (“pseudotumors”) which are a challenge to tackle. Because ERT needs to be administered as weekly or alternate weekly intravenous infusions, this involves daycare hospital admission. Life-long ERT therapy is definitely intrusive. In addition, several are outstation patients [Table 2] and their visits entail significant travel expenses, school and work absenteeism, and loss of wages for parents. Often these factors contribute to poor compliance. Hence after establishing disease control, we encourage patients to receive their ERT infusions in their hometown. Unfortunately, this outsourcing of ERT treatment has at times led to sub-optimal monitoring and undetected co-morbidities such as anemia and vitamin D deficiency. We also encountered difficulty in maintaining stringent temperature control (2°C–8°C) while transporting ERT vials to remote villages, which was often further compounded because of their erratic electricity supply. Because of this logistic limitation, we have had to discontinue outsourcing ERT infusions for a few patients. Two patients dropped out because of family problems. One adult patient with a LSD on ERT had to abandon traveling abroad for higher studies because of inability to continue receiving ERT through compassionate access outside India. Patients with LSDs have to receive ERT life-long. As ERT does not cross the blood–brain barrier, it does not reverse central nervous system (CNS) abnormalities. In addition, it is less efficient in ameliorating manifestations in bones, cartilage, lymphnodes, skeletal muscles, cornea, heart valves, and lungs., Established organ damage, namely, bone or visceral infarcts in Gaucher disease, and chronic kidney disease or strokes in Fabry disease do not reverse with ERT., In classical Pompe disease, symptoms of cardiorespiratory insufficiency develop in the first few months after birth and these patients become ventilator-dependent and succumb by 1 year of age. Hence, timely diagnosis and initiation of ERT in these conditions is vital. In European countries and in the United States, ERT is easily available to all afflicted individuals either through their National Health Services or through health insurance., Improved awareness about LSDs among Indian doctors, availability of diagnostic tests, and setting up of treating centers has resulted in increased numbers of patients with LSDs being diagnosed. However, in our country procuring ERT to treat all diagnosed patients is currently not possible because of its prohibitive cost [Table 1]. Because our health insurance policies do not cover for LSDs, only a few patients get access to ERT. Charitable LSDs programs (mentioned earlier) can recruit only a few patients annually as per their prioritization policies. At our center, only 12, of the 37, confirmed patients with Gaucher disease could get access to ERT. In contrast to Gaucher disease and Hunter disease, treating classical Pompe disease with ERT at our center has been disappointing [Table 2]. Mortality has been 100% in classical Pompe disease in spite of ERT, probably a consequence of initiating treatment late or because of innate disease severity. Another reason for poor response to ERT could have been undetected CRIM-negative status in our cohort of patients with classical Pompe disease. Consequentially, now genotype is obtained in every patient with Pompe disease to predict CRIM status., Two infants having Pompe disease were approved for ERT through INCAP; however, parents declined treatment probably because of complexity and life-long commitment of therapy. ERT infusions require close clinical monitoring to preempt allergic reactions (including anaphylaxis). In patients receiving galsulfase and idursulfase, we use low-protein-binding 0.2 μm in-line filters for infusion along with premedication (antihistamine) administered 30 min before infusion. Apart from occasional mild febrile reactions with imiglucerase and idursulfase infusions, we have not observed any other adverse events. The promise of easy enzyme replacement therapy access in India: What the future holds? In recent years, individual patients and the “Lysosomal Storage Disorders Support Society of India” (LSDSS, a patient advocacy group) have filed writ petitions in the Honorable High Courts in New Delhi, Bengaluru, Chennai, and Hyderabad to direct the government to provide ERT free of cost to patients with LSDs. As an outcome of these litigations, ERT is now being funded for a few patients by the Employee State Insurance Corporation and by the State Government of Karnataka. The landmark judgment in the Mohammed Ahmed versus Union of India case [W.P. (C) 7279/2013] (http://www.delhihighcourt.nic.in/dhc_case_status_oj_list.asp?pno=685222) has led to the Union Ministry of Health and Family Welfare to recently draft the National Policy for Treatment of Rare Diseases. Two initiatives already taken include (i) creating a corpus fund of INR 100 crores for funding treatment of rare diseases (including LSDs) and (ii) development of a web-based online portal for applications for treatment funding. Patients can now email their application for funding to <publichealth2@yahoo.com> the Section Officer, Rare Disease Cell, Ministry of Health & Family Welfare. Long-term goals for rare diseases include to (i) establish national registries and conduct epidemiologic studies to know their prevalence, (ii) facilitate research to improve diagnostic modalities, (iii) encourage indigenous drug companies to manufacture therapeutic drugs, and (iv) measures for price control including waiving import duty for ERT. In conclusion, although LSDs are individually rare, several are currently treatable. ERT is currently the standard of care for selected LSDs and proceeds in parallel with supportive multidisciplinary medical and surgical interventions. The foremost prerequisite is a confirmed diagnosis. Early diagnosis is the key for optimum outcome. Although cost of ERT is exorbitant, there are avenues to access ERT in India. Government funding of ERT in India is anticipated to be introduced in a phased manner for selected ERTs in the near future. Dr. Mamta Muranjan was Principal Investigator for study entitled “A Phase 3, randomized, multi-center, multi-national, double-blind study to evaluate the efficacy, safety, and pharmacokinetics of once daily versus twice daily dosing of Genz-112638 in patients with Gaucher disease type 1 who have demonstrated clinical stability on a twice daily dose of Genz-112638” which was funded by Sanofi-Genzyme. The grant was deposited with the Diamond Jubilee Society Trust of Seth G.S. Medical College and K.E.M. Hospital. She also serves as a Member of Sanofi-Genzyme's Indian Medical Advisory Board, a post that does not involve any remuneration. Wilcox WR. Lysosomal storage disorders: The need for better pediatric recognition and comprehensive care. J Pediatr 2004;144:S3-14. Beck M. New therapeutic options for lysosomal storage disorders: Enzyme replacement, small molecules and gene therapy. Hum Genet 2007;121:1-22. Wenger DA, Coppola S, Liu S. Lysosomal storage disorders: Diagnostic dilemmas and prospects for therapy. Genetic Med 2002;4:412-9. Mehta AB, Lewis S, Laverey C. Treatment of lysosomal storage disorders. Br Med J 2003;327:462-3. Vellodi A. Lysosomal storage disorders. Br J Haematol 2005;128:413-31. Brady RO, Pentchev PG, Gal AE, Hibbert SR, Dekaban AS. Replacement therapy for inherited enzyme deficiency: Use of purified glucocerebrosidase in Gaucher disease. New Engl J Med 1974;291:989-93. Burrow TA, Barnes S, Grabowski GA. Prevalence and management of Gaucher disease. Pediatr Health Med Therap 2011;2:59-73. Desnick RJ, Schuchman EH. Enzyme replacement therapy for lysosomal diseases: Lessons from 20 years of experience and remaining challenges. Annu Rev Genomics Hum Genet 2012;13:307-35. Deat JW, Lilitkarntakul P, Webb DJ. Are rare diseases still orphans or happily adopted? The challenges of developing and using orphan medicinal products. Br J Clin Pharmacol 2006;62:264-71. Kasturi L, Amin AS. Enzyme replacement therapy in Gaucher's disease. Indian Pediatr 2001;38:686-88. Puri RD, Kapoor S, Kishnani PS, Dalal A, Gupta N, Muranjan M, et al. Diagnosis and management of Gaucher disease in India—Consensus Guidelines of the Gaucher Disease Task Force of the Society of Indian Academy of Medical Genetics and the Indian Academy of Pediatrics. Indian Pediatr 2018;55:143-53. Nagral A, Mewawalla P, Jagadeesh S, Kabra M, Phadke SR, Verma IC, et al. Recombinant macrophage targeted enzyme replacement therapy for Gaucher disease in India. Indian Pediatr 2011;48:779-84. Hughes DA, Gonzalez DE, Lukina EA, Mehta A, Kabra M, Elstein D, et al. Velaglucerase alfa (VPRIV) enzyme replacement therapy in patients with Gaucher disease: Long-term data from phase III clinical trials. Am J Hematol 2015;90:584-91. Muranjan M, Patil S. Outcome of Gaucher disease in India: Lessons from prevalent diagnostic and therapeutic practices. Indian Pediatr 2016;53:685-8. Kishnani PS, Steiner RD, Bali D, Berger K, Byrne BJ, Case LE, et al. Pompe disease diagnosis and management guideline. Genet Med 2006;8:267-88. Bailey L. An overview of enzyme replacement therapy for lysosomal storage diseases. Online J Issues Nurs 2008;13:3. Shafie AA, Chaiyakunapruk N, Supian A, Lim J, Zafra M, Ahmad Hassali MA. State of rare disease management in south east Asia. Orphanet J Rare Dis 2016;11:107. Jurecka A, Tylki-Szymanska A. Enzyme replacement therapy: lessons learned and emerging questions. Expert Opinion Orphan Drugs 2015;3:293. Bali DS, Goldstein JL, Banugaria S, Dai J, Mackey J, Rehder C, et al. Predicting cross reacting immunological material (CRIM) status in Pompe disease using GAA mutations: Lessons learned from 10 years of clinical laboratory testing experience. Am J Med Genet C Semin Med Genet 2012;160:40-9. National Policy for Treatment of Rare Diseases, Ministry of Health and Family Welfare, Government of India. Available from: https://mohfw.gov.in/sites/default/files/Rare%20Diseases%20Policy%20FINAL.pdf. [Last accessed on 2018 Mar 20].